The biodiversity in Ethiopia takes you by surprise. 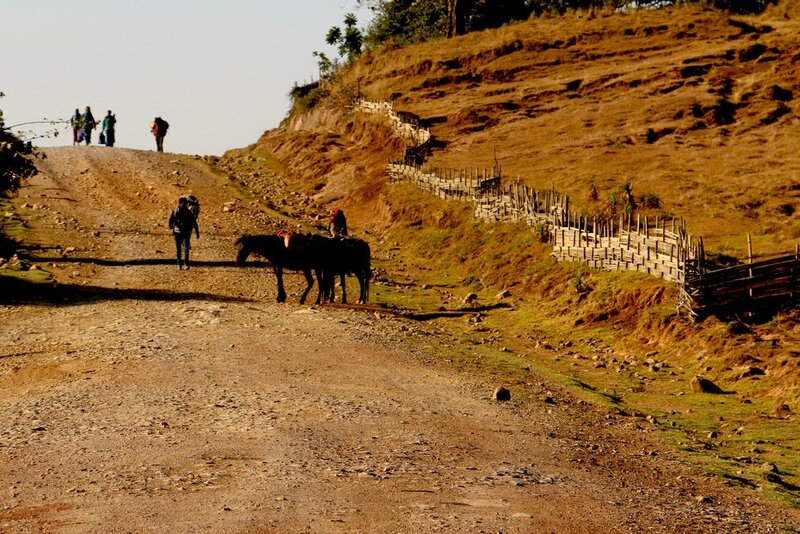 Riding in a 90’s Landcruiser, evergreen forests, arid rolling plains, and lush mountains covered in tropical vegetation catch your eye. During our visit, we had an opportunity to see substantial amounts of countryside as we made our way down to Guji and Yirgacheffe, iconic and famed coffee regions. After all, Ethiopia is the birthplace of coffee. 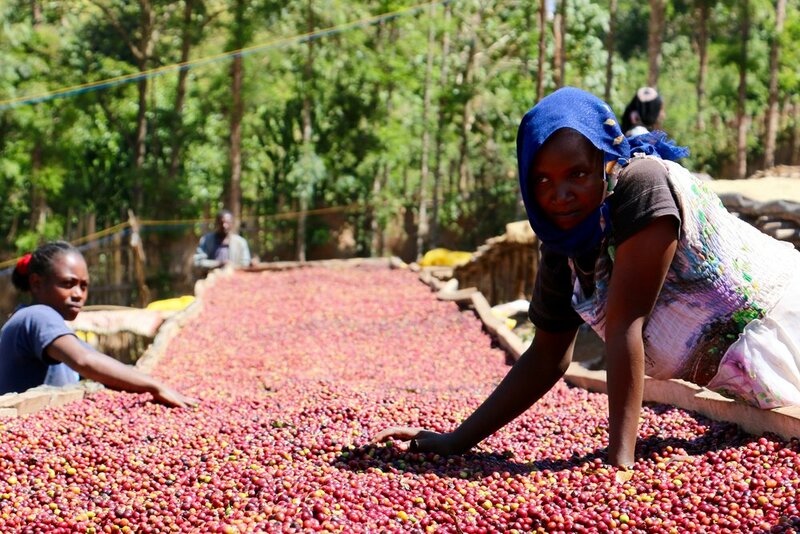 Many coffee professionals learn of Ethiopia’s allure early on in their career. Not only are Ethiopian coffees brilliantly unique and without equals, the people exhibit a ceremonious and thriving culture of drinking coffee; one that is deeply embedded in everyday Ethiopian lifestyle. Indeed, a coffee source trip to Ethiopia is mythic. Coffee cherries from the day's harvest. Our travel host, Sam of Keffa coffee, is an Ethiopian boutique importer whose taste for coffee is matched by none. We’ve been buying his award winning Ardi from for a few years now, a coffee that he has personally curated and developed as a household brand among Specialty Coffee elites. This coffee comes from a small region in Guji, near the one-road town of Kibre Mengist. We traveled to the Adola Mill, where this coffee is harvested and processed, a nine hour car ride not for the faint of heart. Not much is in Africa. The road to the Adola Mill. Upon arriving to the mill, located at 1,730 meters above sea level, we were greeted by over one-hundred farmers and mill workers. They set aside their day to spend time with our group and demonstrate their acutely detailed harvesting practices. This mill, tucked in the dramatic mountains of Guji, receives around 10 coffee roasters a year, traveling from all over the world to see where the Ardi originates. Akilu, a young man that doesn’t look a day over thirty, has dedicated his life to coffee for the past 14 years. There are hundreds of mills in the region—this particular mill was started by the surrounding community 5 years ago and has seen internationally recognized success. Sorting cherries from the Ardi Anasora harvest, Adola Mill. When asked what are the easiest and most challenging aspects of farming coffee, a quiet, satisfied smile comes over Akilu’s face as he replies, “There is nothing easy about coffee, everything is hard.” He then quickly qualifies his commitment to the challenge by saying that he could never abandon coffee, it’s in his blood. The team at the Adola Mill. Akilu, second from right. The mill is constantly working on professional development. A few people have taking courses in cupping coffee in Hawassa, and they are also saving to improve the equipment at the mill, in efforts of sorting the coffees even more meticulously. Most coffees in Ethiopia are sorted on belts, by hand, before going through two other sorting practices. There are 2 million people living in the Guji region, although the Adola mill supports a mere 1,800 farmers. Cumulatively they produce around 2 containers (approximately 75,000 pounds) of Ardi coffee per harvest, which typically starts in September and ends in January. Everyone in the area is enthused by the harvest this year, as the region has received copious amounts of rain, improving the growth and maturation of the coffee cherries, ultimately producing higher quality coffee. Raised beds for drying coffee, covered for the evening. Guji is rich in history and culture. The locals adhere to Gada, their own traditional system of governance. Gada boasts over 1,000 years of functioning history, and is recognized by UNESCO as an original system of government. The coffee mills in the area are very community oriented, sharing ideas and experiences of farming coffee. They also have a soccer league amongst the mills, of which Adola are the reigning champions. Sorting coffee. Each bag is sorted by hand, bean by bean, twice. The Ardi harvest is wrapping up, and we won’t see this coffee until later in the year. It still needs to pass through the ECX, and be exported through Djibouti. We were excited at the chance to taste this incredible coffee in country, and to connect with fellow Ardi laborers spanning the supply chain. Coffee ready for sorting at the dry mill. Stay tuned for the release of Ardi this summer. We are hoping to purchase from Sam and the Adola mill for years to come and we’d love for you to try it.